Whether you live in or around London, or are planning a trip to the Big Smoke around the festive period, there are tonnes of great afternoon teas on offer around the city for you to try. But, because we love a good theme, and a novelty bake or two, here's a countdown of some of the best themed afternoon teas to try, because why go classic, when you can go fantastic? 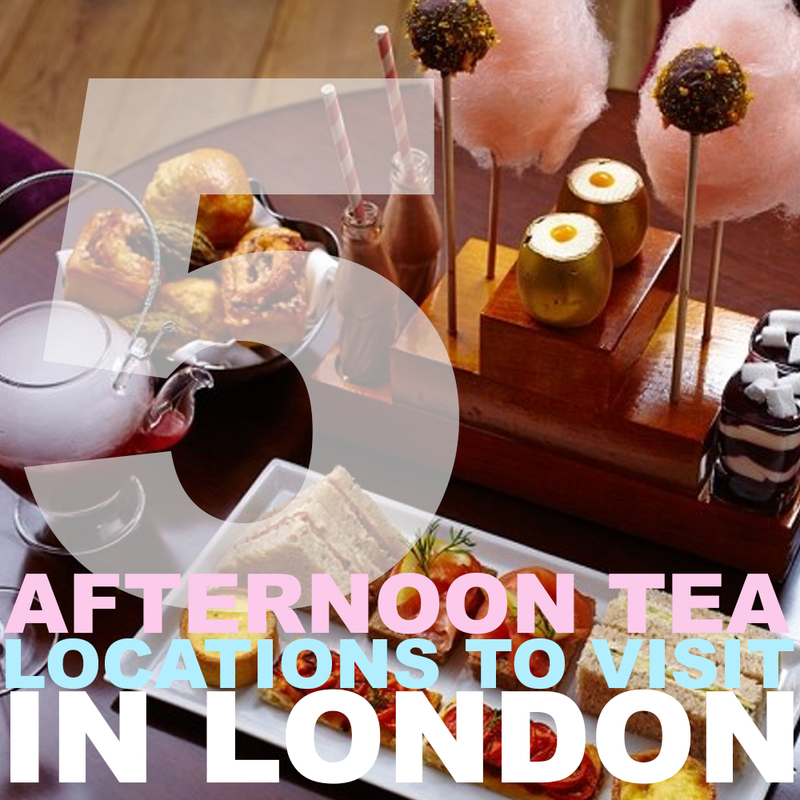 I'm starting off with the only afternoon tea off the list I haven't yet personally visited, but am dying to go to. The reason I haven't been yet? It's always booked up, so make sure you book well in advance, ahead of your special day, or trip! This Charlie and The Chocolate Factory themed afternoon tea you'd think would be completely chocolate-centric, but it's a surprisingly varied menu of sweet and savoury treats and has been jazzed up this season to incorporate more festive offerings, like Winter Spiced Tea and Cinnamon and Chestnut Brioche. If you love the Roald Dahl book this will be right up your street. The whimsical yet gourmand theme of the book lends itself well to an afternoon tea, and at £39 this is one of the more affordable, seeing as it is perfectly placed in central London, in the beautiful One Aldwych 5 star hotel. Sketch is hands-down one of the most Instagrammed restaurants in the whole of London, and it's no wonder with the incredible interiors it houses within its walls. Each room in Sketch was designed by a different artist, but The Gallery Afternoon Tea is the one I'd recommend. All of the staff swish around in long blush gowns, guiding you to your table in hushed tones, that make the whole air of the place so other-worldly and almost Lynchian. The Gallery is completely filled with David Shrigley's hilarious doodles, which are so fun to read through as you're awaiting your afternoon tea. Everything here has Shrigley's stamp on it, from the life advice at the bottom of each cup; 'forget about it', to simply; 'ghosts' written on every teapot. If you love pink, this is an absolute pastel palace, punctuated with copper details as far as the eye can see. Dimly lit and ethereal, it almost calls to mind Professor Trelawney's divination classroom. A Michelin starred restaurant, just off Regent Street, you can expect more cutting-edge and experimental desserts here, and at £45 this is a little higher on the scale, but for the sheer experience it's well worth it. And don't forget to check out the egg shaped 'space' toilets. The great thing about Alice In Wonderland as a theme, is that it invites so many possibilities, and no afternoon tea that I've visited has quite taken the theme as far as this one. Situated within the incredible Sanderson Hotel, this is an interior design dream, and I'd highly recommend embracing the theme and sitting outside in the covered garden. Striped cake stands covered in crazy critters, edible grass, cake-crumb soil and sugar cubes inside music boxes are just some of the many Alice themed touches that make this afternoon tea super special. The menu pasted within an old book sets the tone as soon as you enter, and you choose your tea by sniffing small vials labelled 'drink me' and the like, until you find the tea blend of your choice, all named after characters, obviously. The modern king and queen crockery keep the afternoon tea modern, but it's just as fun for adults as it would be magical for kids. At £48 this is one of the pricier options, but it's sure to be an unforgettable afternoon. If you want to go a little smarter, and fancy heading to the classiest afternoon tea London has to offer, look no further than Pret a Portea at The Berkeley Hotel. The beautiful Berkeley Hotel in Knightsbridge is situated in one of London's most exclusive areas, and its impossible not to feel incredibly special as you enter the hotel, expertly assisted by one of the beautifully-dressed doormen. If you're visiting London and want to experience the London you've seen in countless old movies, this is the place to do it. This tea is fashion themed, and the menu changes every season after fashion week, when the chefs create new desserts based on the top trend pieces of that season. It could be a Burberry biscuit trench, a Mulberry mousse, Saint Laurent shortbread or even as with this season a Charlotte Olympia cinnamon boot. At £52 this is the most pricey afternoon tea, but as it's in a beautiful old Knightsbridge hotel, within a gorgeously art deco Great Gatsby tearoom, and you're waited on hand and foot during your visit, it's a lovely little treat if you truly want to pamper yourself. The final afternoon tea of today's run down is the latest one I've had the opportunity to try, and as you can tell it ranks among my very favourites. If you're big into science, daydream about dinosaurs, consider yourself a sci-fi lover or just love to play mad scientist with the chemistry set, this afternoon tea is for you. The Science Afternoon Tea at The Ampersand Hotel is quite literally a stone's throw from both The Natural History Museum and The Science Museum, and uses the proximity of those great institutions as inspiration. It's hard to choose the most amazing desserts from this afternoon tea, as they truly are all spectacular, from lemon fondant crescent moons, to noisette spacemen and rockets, to full moon macaroon. You're perfectly equipped to experiment, with test tubes of sprinkles, and squeezy lab tubes of sweet sauce to spread on your scones. The most theatrical piece of all is the mint choc chip planet, which is clouded in dry ice at the beginning of your visit, but the fossil selection comes a close second, where you're given fossil brushes to clear away cake-crumb 'dirt', revealing biscuit dino bones and ammonite fossils within. At £32.50 this is the cheapest of the afternoon teas mentioned today, which is incredible being as it truly is one of the very best. Which one of the afternoon teas you've visited you loved the most, are there any we should check out? And which one of these are you dying to try?